20th century cinema that was redesigned by The Sheldon Studios. The four-penthouse Rosebery Avenue apartments from developer Londonewcastle are priced at GBP1.5 million (USD2.52 million). Brixton images courtesy of Richard Sullivan. A wave of up-and-coming neighbourhoods is keeping London on the cutting edge. Erica Sharlette Wallace recalls her early years spent in a rough part of southern London. up. My mother used to work in the centre of it, and I remember we once went to a restaurant to eat when a woman came and sat down in the booth with us. It wasn’t until we were on the way home that we realised her purse was missing.” That was Brixton in the 1980s. a shopping mecca, and has one of the most well-known markets in London,” says Wallace, who still lives in the city and now runs her own public relations firm. “Brixton used to be considered a dump that no one wanted to venture into, and most people did everything they could to get out of it. Now it’s a great example of London’s regeneration,” notes the long-time resident. Along Brixton Road, there is an array of stylish restaurants, bars and cafes, supermarkets, a 1930s-themed department store, Ritzy Picturehouse cinema and O2 Academy (formerly Brixton Academy). “But the calibre of stores now moving into the area is driving up property prices,” observes Wallace. Her childhood memories of a grittier southern London are slowly being erased by a ‘ripple effect’ in the United Kingdom’s largest real estate market. is a ripple effect that impacts the quality and value of properties in outer London, where property prices have increased by as much as 11 percent. “We really have to look at the market in these two areas,” says Tom Bill, residential research associate at Knight Frank, referring to prime central London—where prices have also gone up dramatically in the last 18 months, creating fears of a potentially overheating market—and prime outer London, where the city’s hidden real estate gems could be found. He says that a two-speed market is developing in London as buyers seek better value for money beyond the traditional core areas. More recent commercial developments in south London, such as Brixton Square, demonstrate the “ripple effect in the pricing of bordering areas of southwest London and the transport links of Brixton and its attractions and amenities have seen the average price of properties increase in a very short space of time,” according to Richard Sullivan, sales manager at Eden Harper, a local property sales, lettings and management company. Also born and raised in Brixton, Sullivan notes that the first quarter of 2014 has seen strong activity levels for property in the area, where homebuyers would expect to pay up to GBP900,000 (USD1.52 million) for a one-bedroom converted apartment and well into the millions for a four-bedroom house. But these prices are still worth a fraction of central London’s most expensive properties, such as the recently sold, record-breaking GBP140 million (USD237 million) Penthouse D apartment at One Hyde Park—one of London’s most prestigious addresses. According to property website Rightmove.co.uk, the average asking price for a London property has risen by as much as GBP80,000 (USD153,000) in the first five months of the year due to increasing demand from buyers. Similarly, the Brent Borough about 13 percent higher than they were seven years ago, according to research by global property services firm Savills. great transport—all of the things that really captivate investors, according to Peter Allen, director of sales and marketing at central London-based developer Londonewcastle. Allen recently flew to Singapore and Hong Kong for the Asian launch of the company’s landmark project, Queen’s Park Place, which is set to be completed in the second quarter of 2016. All roads—and tracks—lead to Queen’s Park, the ‘new Notting Hill’. Dubbed ‘the new Notting Hill’ by national newspaper The Telegraph, Queen’s Park is seen as a self-sustaining neighbourhood where residents don’t need to get out. “You’ve got everything you need in Queen’s Park. A lot of families are really attracted to that,” states Allen, adding that a number of celebrities already live in the area, including actresses Thandie Newton and Sienna Miller, and British Vogue editor Alexandra Shulman. Tamzin Greenhill, a New York-based stylist for Elle Decor and former supermodel, has been tapped to design Queen’s Park Place’s interiors, further adding glamour to the area. Aside from the chic factor, the Queen’s Park neighbourhood is also only minutes away from many educational institutions, by both by car or by public transport. “For Asian buyers, it is an interesting area, if they’re thinking of sending their children to study at University College London, London Business School, King’s College, Royal College of Art or London School of Economics—all within thirty minutes of travel time,” adds Allen. The 150-year-old Victorian village’s charm has enticed families, couples and successful young professionals who want to invest in their own properties. 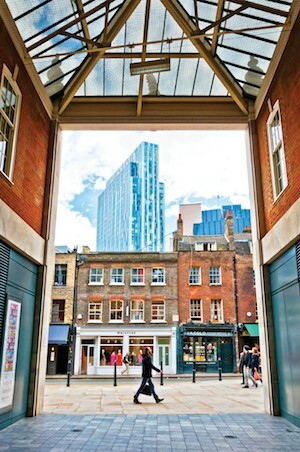 “The area really is a hidden gem with fabulous amenities, good transport links and undergoing widespread regeneration and renewal,” says Rob Soning, Londonewcastle’s chief operating officer. According to a study by UK-based real estate investment consultancy Middleton Advisors, the location’s appeal to homebuyers is heightened by its proximity to a park, mirroring the prestige of Hyde Park in Westminster, where the price of a regular-sized apartment averages GBP870,000 (USD1.46 million). Another rising neighbourhood that puts a premium to green spaces and quality living is the Westminster-based Marylebone in central London, although it has been considered a prime investment hotspot for at least a decade, according to Naomi Heaton, CEO of real estate services firm London Central Portfolio. “Marylebone fulfils all the criteria necessary for long-term stable price appreciation and is an internationally desirably area,” she says, citing the Bayswater, Pimlico and Fitzrovia areas in East Marylebone as having excellent investment potential. Indeed, Marylebone, which enjoys the greenery of Hyde Park and anchors London’s West End, is trendsetting. Savills currently manages several properties in the area, which is dominated by Georgian architecture and stylish Mews houses—the third “sexiest” type of residence in London, according to a recent study by property intelligence group Dataloft—and is minutes away from Marylebone High Street, a fashionable and cultural district lined with hip restaurants and shops, with a very well-connected transport system. Mews houses, such as Devonshire Places Mews in Marylebone, are currently the third “sexiest” type of residence in London. in UK properties, Marcus Cooper Group and Allan Properties in collaboration with Oakmayne Properties, are marketing in Asia the 157 Gloucester Place property in Marylebone. The refurbished period property offers high-quality studios, one-bedroom units and two-bedroom apartments that are located a stone’s throw from seven top academic institutions, including University of Westminster and Royal Academy of Music. “In the last few years, the process for foreign buyers has been a no-risk situation, especially for those based in Hong Kong and Singapore, because their legal systems are very similar to London’s,” notes Allen. “London is seen as the commercial and cultural centre of the English-speaking world. It represents a good diversification for many Asian buyers,” comments Charlie Ellingworth of real estate consulting firm Property Vision. “Amongst the new build purchases, Asian buyers are probably dominant,” he adds. Queen’s Park Place on Salusbury Road overlooks a lush park that heightens its value and appeal. The migration of high-profile buyers from central to little known villages may have been aided by the London Plan, the statutory spatial development framework for Greater London Area. Authored by the Mayor of London in 2004 and released by the Greater London Authority, the plan provides the economic, environmental, transport and social strategy for the city until 2031, and aims to ensure that London is a community of “diverse, strong, secure and accessible neighbourhoods”. lines at Hackney Central, Dalston and Haggerston— another formerly rundown area that is currently witnessing resurgence—may have had a huge impact on the area’s growth. a 21.5 percent increase in prices for the past 12 months—the greatest increase of any London postal code,” discloses Matt Cobb, director of Hatton Real Estate, sales managers of the recently completed LivE2 apartments. Home to hidden cultural gems such as the Geffrye Museum, Broadway Market at London Fields park and Shoreditch’s budding inner city street art scene, Hackney replicates Brixton’s transformation and is on track to become one of London’s marketable residential villages. Indeed, boosted by a combination of new-build and regenerated properties, as well as a the arrival of appealing lifestyle amenities, these once-forgotten neighbourhoods are at the core of a real estate revival that extends beyond the prime London locales. Young families looking for more space and bigger units are heading to Brixton—15 minutes by train or car from central London—in search of more affordable homes, such as this five-bedroom semi-detached Victorian house on Mervan Road, recently sold for GBP950,000 (USD1.61 million). Richard Sullivan of Eden Harper says house prices in Brixton have gone up by as much as 30 percent in the past year. Units at Londonewcastle’s 116-unit Queen’s Park Place start from GBP450,000 (USD748,000). Home prices in Queen’s Park—located 30 minutes away from most educational institutions, or a 15-minute train ride to Oxford Circus in central London by direct Underground line—have gone up with 13 percent since 2007, according to Savills. By 2018, the Crossrail project will provide immediate access to the city in under 9 minutes, or 16 minutes to Canary Wharf’s business district. The freehold, four-storey Devonshire Place Mews house off Devonshire Street in Marylebone is valued at GBP5.5 million (USD9.23 million) and is close to Regent’s Park—a plus, according to study by Middleton Advisors. Savills also manages a stunning three-bedroom, three-bathroom Penthouse 3 unit on Bolsover Street, Fitzrovia, priced at GBP5.95 million (USD10 million). Marylebone has been considered a property hotspot for the last ten years, according to Naomi Heaton, CEO of London Central Properties. Completed last May, local developer Mura Estates’ 13-unit LivE2 apartment complex is located on Whiston Road in Hackney, a neighbourhood which experienced a 21.5 percent increase in home prices in the last 12 months, based on Land Registry data. The area is within close proximity to Shoreditch’s vibrant street art scene. Whilst the Haggerston and Hoxton stations and numerous bus routes along Kingsland Road and Liverpool Street are close by. Prices start at GBP525,000 (USD883,00) per unit via Hatton Real Estates. 20th century cinema that was redesigned by The Sheldon Studios. The four-penthouse Rosebery Avenue apartments from developer Londonewcastle are priced at GBP1.5 million (USD2.52 million). Brixton images courtesy of Richard Sullivan.